It’s funny how I always say that I don’t really like fried food but a lot of the recipes I have on the blog are all deep fried in oil. I guess it’s the Colombian side in me that gravitates towards eating something fried every now and then. One of my favorite fried chicken places in Colombia is the ever so popular Frisby. I’m not really sure how they make their batter but it’s simply delicious. Oh! And the best part? They serve everything with a side of plastic gloves so your hands don’t get all greasy. So fancy! 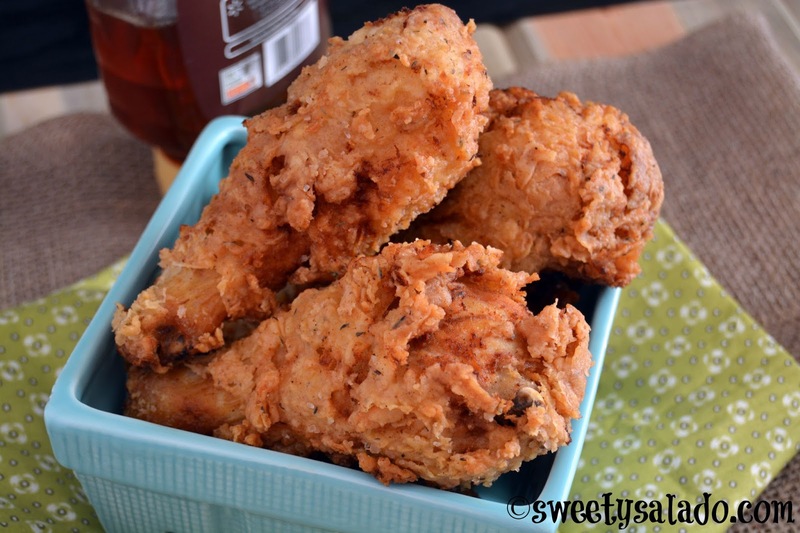 The best thing about making fried chicken at home is that you can season it however you want. You can make it spicy, crispy and season it with all kinds of herbs and spices. I like to make it with a little bit of cayenne pepper and cumin to give it a little kick and I also like to double dip it in the buttermilk to make it crispier. I have to admit that I have never mastered the art of frying it in a skillet or a big pot. I can never get the oil temperature right, it’s either too hot and then it gets too cold and I end up making the nastiest fried chicken you could ever serve. So, that’s why I always, always use an electric deep fryer. You set your temperature to whatever number you want and the deep fryer never lets the oil get too hot or too cold, giving you the most beautiful golden brown crust. So if you have one, now it’s the time to use it! 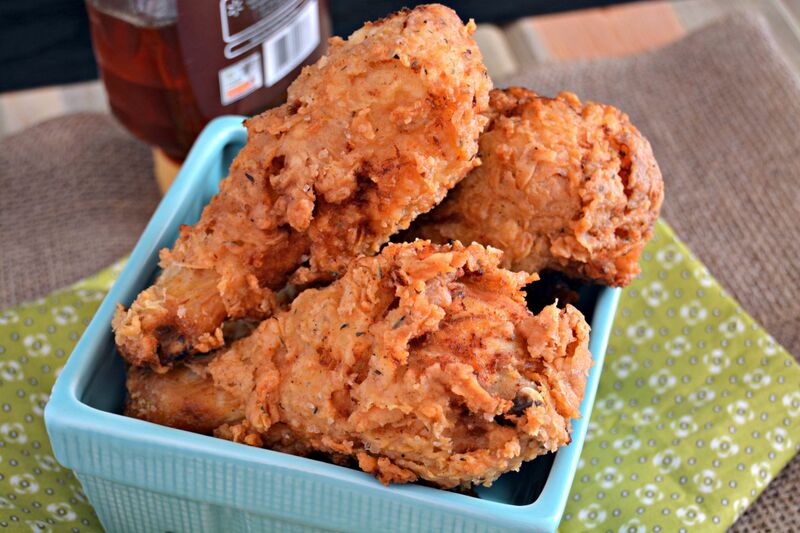 Place the chicken in a large bowl and pour in the buttermilk and salt. Mix to cover each piece of chicken really well, cover with plastic wrap and refrigerate at lease 4 hours. Then, take the chicken out of the fridge and let it rest at room temperature about 30 minutes before frying. Reserve the buttermilk. Preheat the oil in a deep fryer, large pot or skillet at 350ºF (180ºC). In a shallow pan or baking dish mix the flour, salt, sugar, pepper, onion powder, garlic powder, paprika, thyme, cayenne pepper and cumin. Breading: Dip each piece of chicken in the buttermilk you reserved previously and then cover with the flour mixture, shake off the excess. Repeat this process a second time, dip the chicken once again in the buttermilk and cover it with more flour. Fry the chicken in the preheated oil for a total of 20-25 minutes or until the crust is golden brown and the juices run clear. Make sure to turn it over half way through the cooking process. Then, let it drain for a few minutes over a wire rack with paper towels underneath before serving. 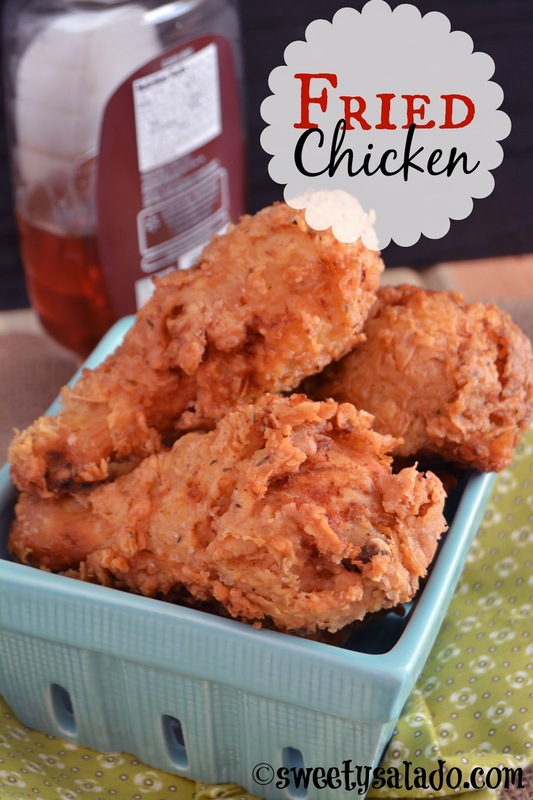 If you're frying your chicken in batches, cover the cooked chicken with aluminum foil and place it in a warm oven (200ºF o 93ºC) while you finish cooking the rest of your chicken. Me encanto la receta, me imagino el exquisito sabor. Gracias por compartirla!